There is no longer any downtime in American culture. Everything matters, and everything seems to have some sort of effect upon the citizenry. The change, over time, has been the impact of American politics. In the past, Americans could ignore the government until it was time to elect new officials. Today, every day brings new revelations of government dysfunction and gridlock, and that news produces a reaction from the people who invest according to events of the day. As part of Spectrem’s monthly Confidence Index report, investors in March were asked “What is the most serious threat to achieving your household financial goals at this time?”. The responses were mostly split between politics and the stock market. And the history of the question shows that those two factors are more impactful today than in past months and years. Twenty-six percent of all investors chose “political climate” as the No. 1 factor threatening their household financial situation. That is the highest percentage for that answer since March of 2017, when it reached 30 percent. The 26 percent was a 4 percent increase over the previous polling in December. Following closely behind “political climate” was “market conditions’’, with 20 percent of the responses. That also had a 4 percent increase over the last time the question was asked, in December. Back in June of 2016, “market conditions’’ was the No. 1 threat to 22 percent of all investors. After the top two responses, the other factors fell in line far behind. “The economy” was selected by 8 percent of respondents. “International situation”, which got 7 percent of the responses in September of 2017, received only 2 percent in the most recent polling. 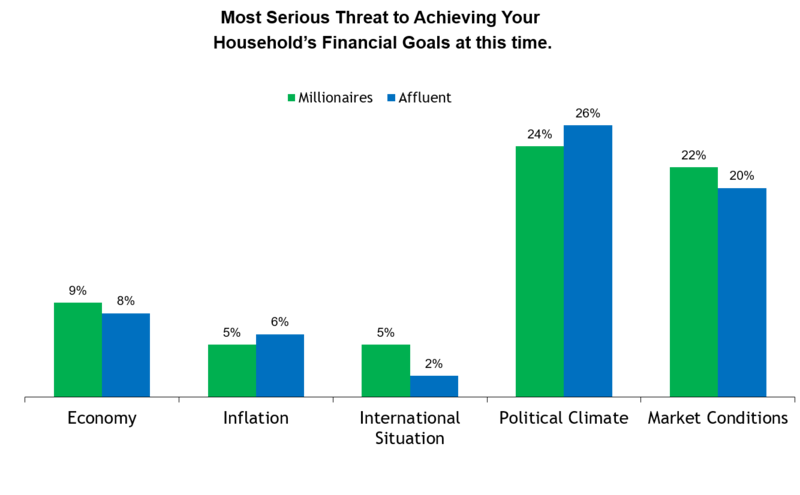 Millionaires had a slightly higher regard for the difficulties related to market conditions than did non-Millionaires, and they were less likely to choose “political climate” as the No. 1 factor. When investors were segmented by their working status, there was a large difference in responses. Thirty percent of retired investors chose “Political climate” as the No. 1 factor and only 16 percent noted “market conditions”. Among working investors, 23 percent selected “market conditions’’ and only 20 percent looked to “political climate” as the top threat to household financial success.